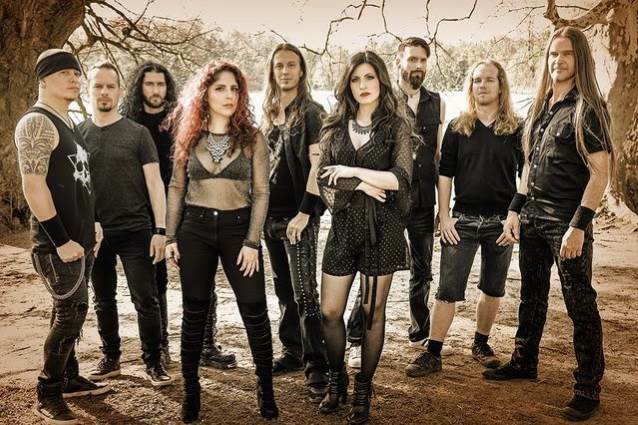 MAYAN — the band featuring EPICA guitarist/songwriter Mark Jansen alongside Jack Driessen (ex-AFTER FOREVER) and Frank Schiphorst — will release its new album, "Dhyana", on September 21 via Nuclear Blast. Jansen states: "We have worked with all our energy, efforts and passion to create a remarkable album. 'Dhyana' (which means the moment when the mind gets absorbed by the heart) makes us all very proud and we can't wait for it to be released. With the support of our loyal fans worldwide we were able to record the album with the City Of Prague Philharmonic Orchestra. Because of this and also producer Joost van den Broek's know-how and enormous motivational drive we were able to meet the high standards of the best productions of today. It's needless to say that we are extremely excited!" Today, the band is giving fans an insight into the recording with the City Of Prague Philharmonic Orchestra in the first album teaser. Watch below to find out more.